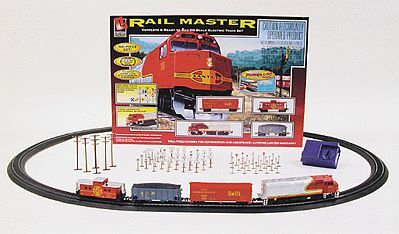 This is an Rail Master Santa Fe Model Train Set HO Scale from Life-Like Trains. Retail $110.99 SAVE 24% ! Set includes F40PH diesel locomotive with working headlight, two-bay hopper car, refrigerator car, eight-wheel caboose, 45 x 38" 114.3 x 96cm oval of Power-Loc Track layout, 38 railroad signs, 24 street and highway signs, six utility poles with transformers, call boxes and street lamps, pair of extra couplers, illustrated instructions and a copy of "Beginner's Guide to Model Railroading."